I was recently parked with a couple of pickup campers. 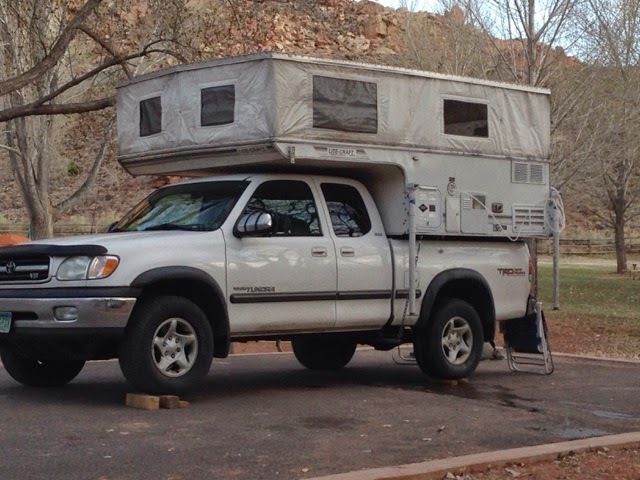 Both are light weight camper on a Toyota trucks. The one above is on a 4 door short bed Tacoma. Seeing this first one got me thinking about what I may want to be my method of travel if I travel again in 2016. Stealth parking isn't a large requirement in my travels that the Prius fills very well. 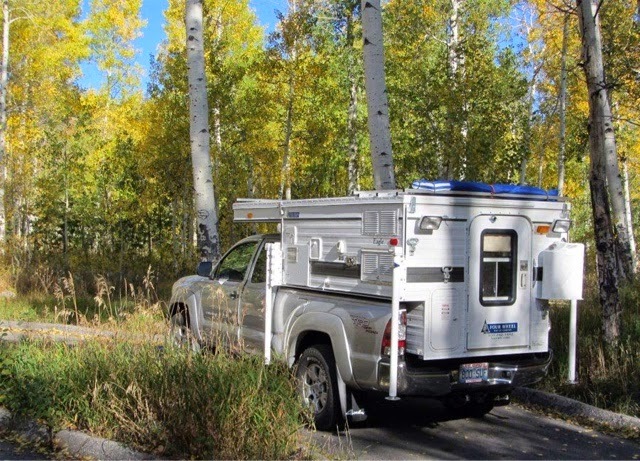 The safety concern that many do express about truck campers is that you have to go outside to get to the cab to drive away. I have seen blogs where some with pickup camper that remove their rear truck window and camper window and with the inflated donut between the cab and the camper pumped up it seals the opening snd they can slide through, although they admit it isn't very comfortable act to do. To address this security issue on this trip I have tested on the Prius laying down the driver's seat fully back and sliding over it easing the seat back and starting it raising the seat back and driving off without getting out of the rear door and getting in the driver's door. I have not had a security issue to take this action but did do it on one stealth parking night. 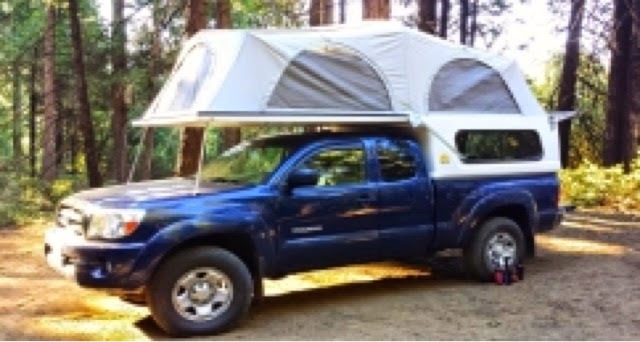 I do have a Tacoma extended cab with standard bed length. I had thought about using a cap or a light weight camper for my 2014 years travels, but the problem is that all the companies that make such a camper are west of the Mississippi. 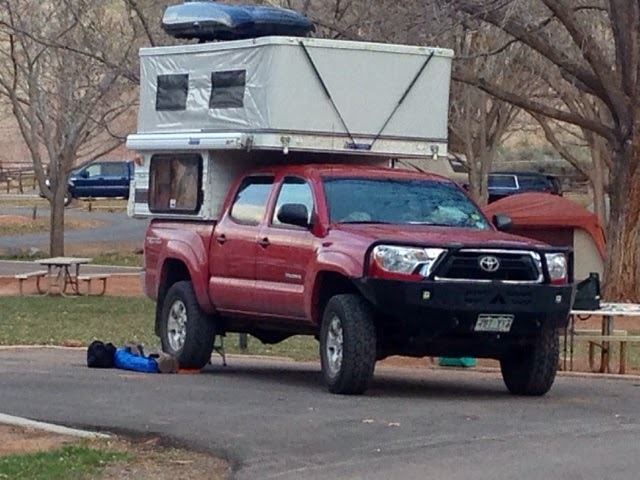 Here is a different truck camper on an extended cab with full bed on a Toyota Tundra chassis. What the two have in common is that they can, if you are careful on what you bring, stay under the 1000 lb load rating for the chassis. They do this with having the top pop up with a high tech material thus not having the weight of the normal material. Their fully loaded models can go over the rated capacity especially when they are wet (with water and supplies). Regardless of hard top or tent top the weight of 800+ lbs dry and pushing at least 1000 lbs you should have at least a 6 cyl engine with tow package for transmission cooler and heavy duty alternator. They also recommend rear air bags to level the loads and take the strain off the rear springs. The Tacoma is a great truck with reasonable fuel mileage, and excellent road clearance. My truck is s 4x4 that makes BLM lands much more easy to take than the Prius. I have not decided on this method of travel for next year but it remains a consideration. The problem is that I would have to drive my truck across the U.S. To get to a dealer and haul all my equipment and supplies with me and then have the core installed and then install the other things. Since I would want to modify the electrical system to support my electronics needs it would make for a work in process that would take away from my travels. Of course the Prius has a lot of positives going for it as my campervan that the incremental costs of buying a pickup camper my not make it financially feasible as long as I continue to traveling by myself. I will review other traveling options in the future. Day 103 - How Much Water?